A cooling system works by sending a liquid coolant through passages in the engine block and heads. As the coolant flows through these passages, it picks up heat from the engine. The heated coolant then passes through a rubber hose to the top inlet of the radiator in front of the car. The coolant flows down through the thin tubes in the radiator; the hot coolant is cooled by the air stream entering the engine compartment from the grill in front of the car. Once the coolant has made its way to the bottom of the radiator and is cooled it returns to the engine through a rubber hose to absorb more heat. The water pump has the job of keeping the fluid moving through the entire system. On most cars today the radiator is made of thin aluminum tubes with aluminum fins that zigzag between the tubes. Air is pulled through the fins via cooling fans causing the heat in the radiator to be transferred into the air stream and carried away from the vehicle. The radiator has two tanks, one for inlet of heated coolant and the other for outlet of the cooled fluid. The cooling system is sealed. When the coolant gets hot it expands and causes an increase in pressure in the cooling system. When coolant is under pressure the boiling point of the liquid becomes higher. Coolant is made with ethylene glycol, which has a higher boiling point than water, along with keeping it under pressure allows the coolant to safely reach temperatures in excess of 250 degrees. The pressure cap is a simple device that will maintain the pressure in the system to a certain point. If the pressure builds up higher than the set pressure point there is a spring loaded valve that allows the pressure to release. During this process a small amount of coolant is bled off into the Reservoir tank which is not pressurized. Since there is less coolant in the system, as the engine cools down a partial vacuum is formed. The radiator cap on these closed systems has a secondary valve to allow the vacuum in the cooling system to draw the coolant back into the radiator from the reservoir tank. A water pump is a simple device that will keep the coolant moving through the system as long as the engine is running. The pump is driven by either a fan belt which usually drives another component, a serpentine belt which drives all components, a timing belt, or in some cases gear driven. The thermostat is simply a valve that measures the temperature of the coolant and, if it is hot enough, opens to allow the coolant to flow to the radiator. If the coolant is not hot enough, the flow to the radiator is blocked and fluid is directed back to the engine via a bypass system. Because flow to the radiator is blocked, the engine will reach operating temperature sooner and, on a cold day, will allow the heater to begin supplying hot air to the interior more quickly. The hot coolant is also used to provide heat to the interior of the vehicle when needed. The heater core looks like a small version of a radiator, connected to the cooling system with a pair or rubber hoses. One hose brings hot coolant to the heater core and the other hose returns the coolant back to the engine. A fan called a blower, draws air through the heater core and directs it through the heater ducts to the interior of the car. 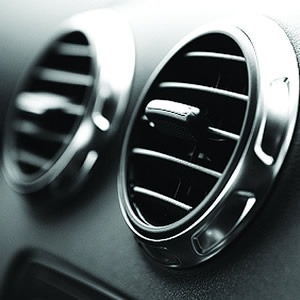 Temperature of the heat is regulated by a blend door that mixes cool outside air or air conditioned air with the heated air coming through the heater core. The temperature gauge. If you notice or engine is running hotter than normal, itâ€™s time for an inspection. Squealing noise when engine RPM increases. Could mean a loose belt which would cause poor circulation of the water pump.